Solutions Cubed, LLC is an innovative group of engineers dedicated to making cool products and employing creative engineering for our clients. Our services range from the early stage electronic prototyping to full production runs. Our business philosophy is tied directly to the origins of our company. It colors our engineering efforts, client relations, and work ethic. It makes us the right provider for the products you use and the electronic designs you need. Our story begins in Chico, California, an inviting valley college town. In 1994 three electronic engineering students were preparing to graduate from college. At the time Silicon Valley was the assumed destination of all engineering graduates looking for that first lucrative job. To three engineering students in Chico the Bay Area looked like a vortex of traffic, concrete, and cubicles. As we pondered the next step in our professional careers, we came to a simple conclusion. Friends don’t let friends work in Silicon Valley. And so we started our own engineering firm in the town we loved. 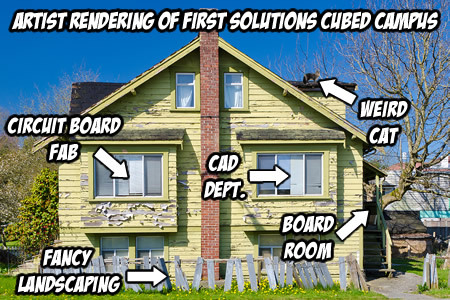 In the early days we operated Solutions Cubed out of our dilapidated rental. As roommates and business partners we sipped beer at our Wednesday night “business meetings” on the porch. We made circuit boards in the oven, printed invoices in the living room, and spent the little money we had at the local taco trucks. It didn’t take long to move out of that house. And within a few years we were completing electronic designs for household names like General Electric, Lockheed Martin, and Hewlett Packard. Over the years our designs have travelled the oceans in deep-sea robotic systems and even reached the International Space Station. Our electronics help fight fires, guard banking transactions, and even train future engineers. Our engineering services have turned small companies into big companies as they produced and sold hundreds-of-thousands of our designs. By building a business from scratch we’ve put our lives into developing our engineering skills. We know how important these designs are to our clients. We also know that being in business is not just about the paycheck. It’s about relationships and making decisions that make life better. That also happens to be the heart of good engineering. No matter the size of your company or design, we want to hear from you. Please contact us with your design needs and product ideas.